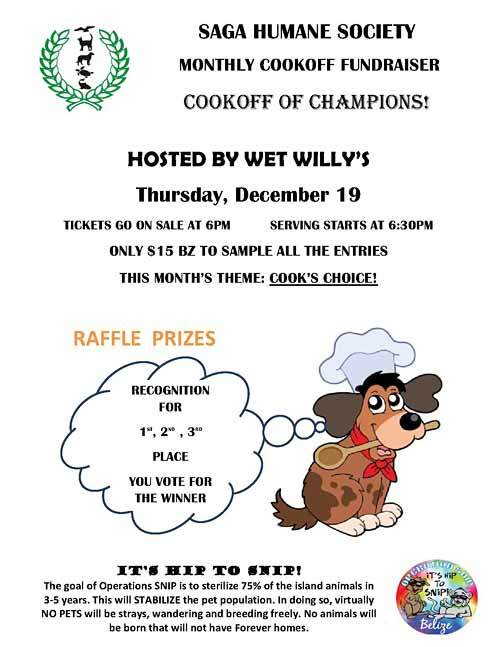 Saga Humane Society is please to announce our end of the year Cook Off of Champions Thursday December 19 at Wet Willy's Cantina. Competing for the prize will be the winning Chefs from throughout the year from our monthly cook offs. The theme is Cooks' Choice. It is our favorite, as the Chefs surprise us every year with their creatively. Tickets go on sale at 6pm, arrive early to guarantee you will get a chance to vote for your favorite. 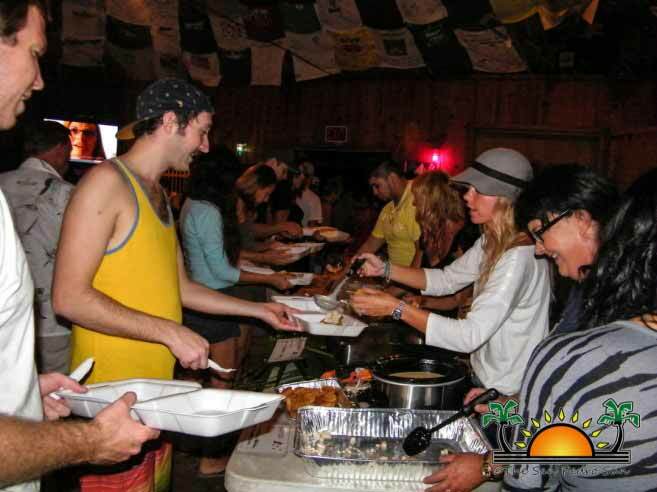 Hungry foodies made their way to Wet Willy’s Cantina on Thursday, December 19th for Saga Humane Society’s Cook Off of Champions. Of course food tickets for Saga’s final Cook Off of the year sold out nearly instantly, but even the long wait in line for food was pleasant as Brent Butcher serenaded the crowd. All funds collected from the night were being matched by Saga Board Member, Heather Beck. The family event raised much needed funds to cover the expenses to spay and neuter 40 pets. There was certainly no shortage of tasty dishes, from Orchid Tree Catering’s Lobster Pâté to a fun Meatball Slider from Wet Willy’s, and the food was certainly championship level tasty. But in the end there could only be one top winner and that honor went to Fido’s Restaurant and Bar with their scrumptious and festive Shiitake Lobster Bisque. Nancy Nida, from Fidos’s, was thrilled to receive a gift basket from Lemon Crush Belize. Coming in a close second was Cindy Firth, for her Chicken in Phyllo with a Champagne Sauce. For her delicious dish, Firth received a Digicell cellular phone. And finally in third place was Feliz Bar’s Potato Salad, who won a matted print from Debbie Cooper. Other dishes included Texas Style BBQ Chicken Sushi with Aioli Sauce by Ruben Gonzalez, German Style Gnocchi by Sharon Metcalfe, Roasted Tomato Soup with Seasoned Crackers by Laura Sutton, and Eastern Wrap by Melt Café. Saga would like to thank all the chefs that participated; the Cook Off would have not been a success without them. Big thanks also go out to Renee Steinmetz, Iliana Paj, Lara Goldman, Cindy Firth, Jamina Morazales, Grant Crimmins, Jacqueline Cervoni, Lacy Salinas & Carolina, Omar Alavarez and Sucely Blanco. Bark bark meow, and a Merry Christmas everyone!